One of the great things about a stay-cation - is having the time to make something really good for lunch. Don't get me wrong, I really like leftovers for lunch, and have them quite often, but sometimes it's nice to make something fresh. 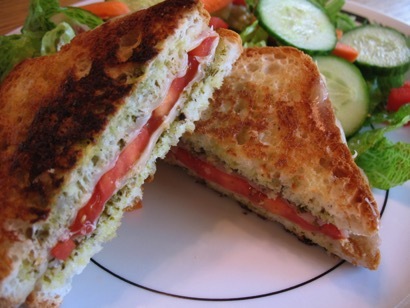 Since we had a couple of tomatoes from the farmers market just begging to be used, we decided to turn our Pesto Grilled Cheese Sandwich into a Pesto Tomato Grilled Cheese Sandwich. Drizzle olive oil on one side of each slice of bread. This side will be placed directly on the heat. Spread pesto on the non-oiled side of each slice. Lay down the tomato slice. Lay down the last slice of cheese. This encases the tomato in an envelope of cheese. Cover with remaining slice of bread. Remember Pesto side toward the cheese/oiled side on top. Place sandwich on pan and cover. Covering will help the cheese melt. Do the same to the next side. Since GF bread slices tend to be smaller, I made 2 sandwiches. If you're looking for gluten-free tomato soup to go with this, check out our Gluten-Free Tomato Soup! This recipe is adapted from Living Without Summer 2005 issue. It's one of our favorites and gets rave reviews from all who've tried - gluten-free or otherwise. We save it for the fall/winter when it's cold and yucky on the outside and warm and yummy on the inside. Add olive oil, butter & garlic to a large soup pot over medium heat. Saute until onion is transparent and soft. Add celery, carrots, potato. Saute for another 5 minutes. Add tomatoes, oregano, salt and chicken broth. 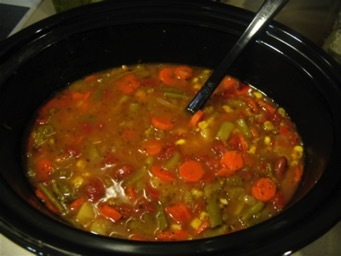 Bring soup up to a simmer. Cover and cook for 15-30 minutes. Veggies should be tender. Add the corn, green beans, kidney beans, zuchinni and simmer for another 15-30 minutes. Stir in fresh basil or add frozen pesto cubes and allow to melt. Serve hot and don't eat too much. You could also top with fresh grated Parmesan cheese. Since we made a double batch, we use both kidney beans and black beans. In the summer I will make fresh basil pesto. This is usually a Saturday project for me. We have a little farmers market downtown and I'll get several bunches. I'll whiz up a batch and pour it in ice cube trays and freeze it. After about a month of pesto making, we'll have several freezer bags full of pesto cubes we can use for a whole bunch of things...like this soup!